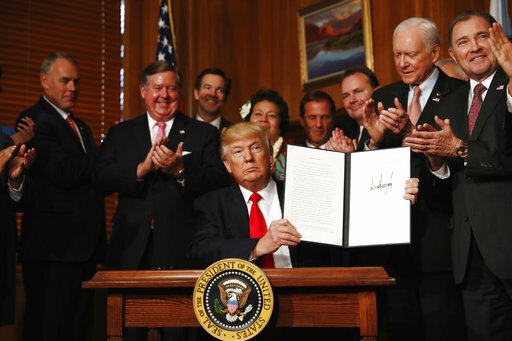 CEDAR CITY – Slamming what he called “a massive federal land grab,” President Donald Trump signed an executive order Wednesday directing his interior secretary to review the designation of dozens of national monuments on federal lands. The measure orders Interior Secretary Ryan Zinke to review approximately 24 to 40 monuments designated in Utah and other states by former presidents under the Antiquities Act of 1906 limiting public access to millions of acres of land. The act authorizes the president to declare federal lands as monuments and restrict how the lands can be used. Wednesday’s executive order comes as the president is racking up accomplishments in his first 100 days. See the video top of this report. Former President Barack Obama infuriated Utah Republicans when he created the Bears Ears National Monument in late December on more than 1 million acres of land located in San Juan County, Utah. Some of the area is home to tens of thousands of archaeological sites, including ancient cliff dwellings, and is considered sacred to Native Americans. 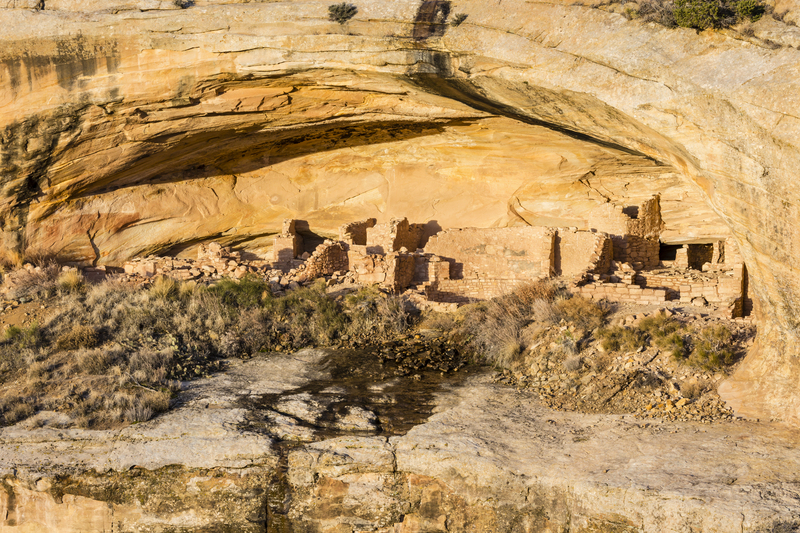 However, the local Native American tribe and citizens objected to the monument designation arguing that the cliff dwellings and other archaeological sites were already provided protections as a wilderness study area. Wilderness study areas are roadless tracts of land of at least 5,000 acres that have scientific, scenic or historical value. They have largely been impacted by nature more than human activity. Recreation and other activities are somewhat limited in these areas and generally do not allow for any vehicle use. In an interview with St. George News, San Juan County Commissioner Phil Lyman said the monument designation has had a negative impact in some of these areas by increasing the number of visitors and in turn disrupting the wilderness and wildlife the designation was meant to protect. “The Antiquities Act does not give the federal government unlimited power to lock up millions of acres of land and water and it’s time we ended this abusive practice. … This should never have happened,” the president said, referencing Bears Ears. Trump’s words echoed statements by Zinke who also spoke prior to the signing. 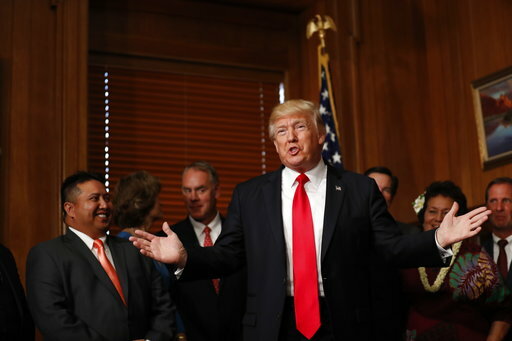 The largely Republican Utah Legislature asked Trump to reverse the Bears Ears designation via a resolution passed during its general session earlier this year and while Lyman said 95 percent of his constituency would like to see that happen he’s also aware there is no precedent set for doing so. Lyman voiced concern that if they tried to rescind Bears Ears in its entirety, the action would end up in court for years. To that end, the county commissioner said at the least, he wants to see the monument reduced to less than 200,000 acres and the designation to remain specific to the north end. Lyman and his two fellow commissioners have a meeting scheduled with Zinke next week during which they will discuss the issue of Bears Ears. Under Trump’s order, the interior secretary will review monument designations dating back to 1996 and beginning with the designation of the Grand Staircase-Escalante monument located in Kane and Garfield counties. The monument, designated by then-President Bill Clinton, takes in 1.8 million acres. The order limits the review to national monuments comprising 100,000 acres or more or where the secretary determines that the designation or expansion was made without adequate public outreach and coordination with relevant stakeholders. Zinke will provide an interim report in 45 days on Bears Ears and such other designations as he determines to be appropriate for inclusion in the interim report. Additionally, Zinke will provide a recommendation and a final report of the entire review within 120 days. “This is a once-in-a-lifetime opportunity to address the egregious actions of President Clinton in 1996 and President Obama in 2016 and sets in motion the chance to reverse the process that occurred at those times where local and state voices were not only not considered but entirely ignored,” Garfield County Commissioner Leland Pollock said of Trump’s executive order and the Grand Staircase-Escalante. Along with the Bears Ears resolution, the Utah state Legislature passed a similar measure in February to reduce the size of the Grand Staircase-Escalante monument. Over the last 20 years, Zinke said, tens of millions of acres have been designated as national monuments, limiting their use for farming, timber harvesting, mining and oil and gas exploration, and other commercial uses. Some, including Sen. Orrin Hatch, R-Utah, have hailed Trump’s order as the end of “massive federal land grab by presidents dating back to Bill Clinton. Pollock praised Hatch for his efforts in working on this issue. 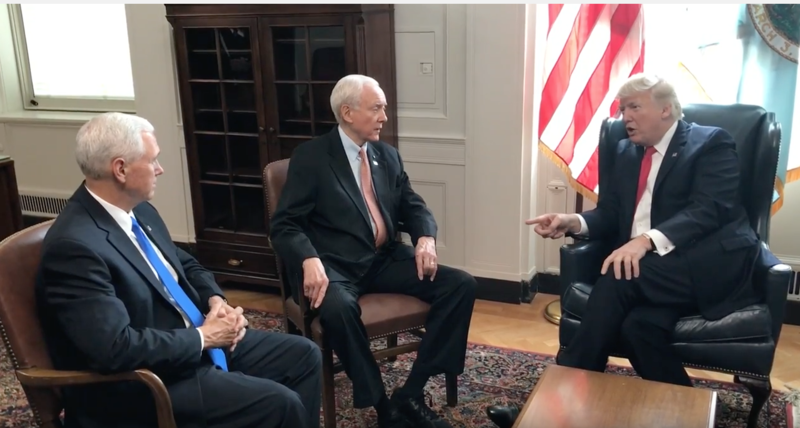 The president also lent credit to the senator for his dedication, additionally pointing to the work of Utah Sen. Mike Lee regarding this issue. While the order is being heralded by many as a step toward undoing the “egregious acts of Clinton and Obama,” there are those on the opposing side who criticized the president’s action. Sen. Marin Heinrich, D-New Mexico, said that if Trump wants to make America great again, he should use the Antiquities Act to protect and conserve America’s public lands. In New Mexico, Obama’s designation of Rio Grand del Norte National Monument and Organ Mountains-Desert Peaks National Monument have preserved important lands while boosting the economy, Heinrich said, a story that has been repeated across the country. Recent polls have shown strong support for national parks and monuments, Christy Goldfuss said. Goldfuss directed the White House Council on Environmental Quality under Obama. The order is one of a handful the president is set to sign this week as he approaches his 100th day in office. The president has used executive orders aggressively over the last three months, despite railing against their use by Obama when he was campaigning. DARLENE SUPERVILLE, Associated Press, and JILL COLVIN, Associated Press, contributed to this report. Associated Press writer Matthew Daly contributed to this report. Full text of the order follows below. Racking up what accomplishments? What significant legislation has passed in his first 100 days? He’s made lots of executive orders, sure, but these will have limited effect. What significant accomplishment does he deserve credit for? Justice Gorsuch? That seat was stolen without any help from Trump. Excellent Executive order by the President, too bad the sore losers always have something negative to say.All sane Utah residents are very happy to give the states the right to make determinations that OBAMA tried to give to the Federal Government, another win!! The Antiquities Act needs to be rescinded or revised. It was intended to protect specific finds, not so a president 100 years later could use it to land-grab over 2,500 square miles of land (Grand Staircase) with zero input from the state involved. That’s bigger than the entire states of Delaware and Rhode Island, for those keeping track. Bears Ears is almost as big, larger than Rhode Island. I wish the feds would grab it all–maybe not so much with the donald in charge, but still……. The increase in national monuments has made it possible for local Utahns who enjoy the outdoors to still escape from the crowds now that Utah is promoting the Mighty 5. Tourism is a business that brings lots of jobs and dollars to our economy for the long term and not just a company’s short term profits. The monuments are a win/win for our environment, overall economy and enjoyment for us currently and those in the future. Let’s keep the monuments for us and our future generations to enjoy.